Astronomy in Victorian Britain, unlike that on the continent, was not funded by the government. Instead, astronomy was the domain of wealthy amateurs who founded learned societies, commissioned telescopes and built observatories. New telescope technologies and further observations provided new material to explain and theorize about. One of the major theories was the nebular hypothesis. This was the name coined by William Whewell in his Bridgewater Treatise. Whewell combined the theory for the origins of the solar system by Pierre-Simon Laplace in his System of the World (1796, trans. 1830) and the suggestion of William Herschel that observed nebulae might be new nascent solar systems. The hypothesis was that the apparent swirling patterns observed in the heavens were composed of gas or dust condensing into a star. Debris at the outer edges of the neubula would become planets. The background to the Victorian science section depicts a contemporary representation of a nebula. The nebular hypothesis was made widely famous in two popular works, the first inspiring the latter. The first, Views of the architecture of the heavens (1837), was written by a professor of astronomy at Glasgow, John Pringle Nichol. 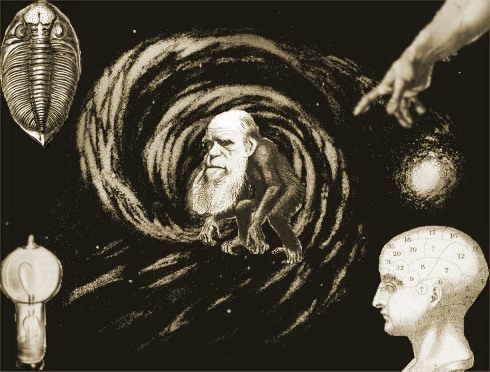 Robert Chambers, in his anonymously published Vestiges of the natural history of creation (1844), used the nebular hypothesis as the backdrop for his theory of cosmic development or evolution. For Chambers all of nature was the unfolding enactment of deep natural laws which prescribed the evolution of the heavens, the ages of the earth, and the evolution of life. All was progress, according to Chambers, from swirling clouds of dust forming solar systems to organic life progressing ever onwards. Chapman, Allan. The Victorian Amateur Astronomer. 1998. Crowe, M. J. Modern Theories of the Universe from Herschel to Hubble. Lightman, B. Constellations of Meaning: Religion, Gender and Ideology in Late-Victorian Astronomy. in progress. North, John D. The Norton History of Astronomy and Cosmology, 1995. Schaffer, Simon. ‘The Nebular Hypothesis and the Science of Progress’, in Jim Moore ed., History, Humanity and Evolution, Cambridge, 1989, pp. 131-164.